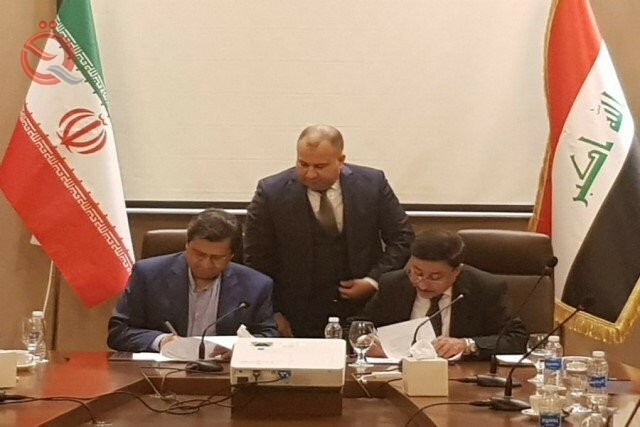 The Central Bank of Iraq and its Iranian counterpart signed an agreement on the mechanism of financial payment between the two countries. "An agreement was signed with the Central Bank of Iraq on the mechanism of financial payment related to the exports of electricity, gas and other Iranian goods to Iraq," IRNA news agency reported. "We are currently witnessing a significant volume of exports, whether in the public sector or the private sector, but there are some obstacles in the banking and financial, which expose exporters to problems in this area." "During this two-day visit, I will hold talks with the Governor of the Central Bank and the Iraqi Finance Minister on the issues and obstacles that exist in order to reach the desired result in this area," Hamati said. Iraq imports electricity from Iran through four lines and a capacity of 1,000 megawatts, while importing dry gas to operate some power plants. Iran is also one of the countries on which Iraq relies heavily on imports of goods and goods. The two central banks of Iraq and Iran signed an agreement on the mechanism of financial payment between the two countries. The agreement was signed on Tuesday in Baghdad by the head of the Central Bank of Iran Abdul Nasser Hamati and his Iraqi counterpart Ali al-Alaq. The main focus of the mechanism is how to pay the amounts related to exports of electricity, gas and other Iranian goods to Iraq. The signing of the agreement came after talks between the parties at the Rashid Hotel in Baghdad. Hamati pointed to the excellent political, economic and trade relations between Iran and Iraq, pointing out that his visit aims to hold meetings with Iraqi officials to discuss the latest developments on cooperation between the two countries. "We are currently witnessing a significant amount of exports both in the public sector and the private sector, but there are some obstacles in the banking and financial field, which exposes exporters to problems in this area. During the two-day visit, Hmati will hold talks with the Governor of the Central Bank and the Iraqi Finance Minister on existing issues and obstacles in order to reach the desired result in this area. The President of the Republic, Barham Salih, discussed Wednesday with the Governor of the Central Bank of Iran Abdul Nasser Hamati ways to strengthen bilateral relations between the two countries. "The President of the Republic today received at the Peace Palace in Baghdad, Governor of the Central Bank of the Islamic Republic of Iran, Abdel Nasser Hamati, and the delegation accompanying him," a statement from Saleh's office said. "The meeting discussed the economic and financial issues and the importance of expanding trade activities, in order to strengthen the bonds of financial handling, as well as strive to support the development process and provide investment opportunities." "The meeting also discussed bilateral relations and means of enhancing them in all fields, in order to achieve fruitful cooperation and partnership," the statement said. Prime Minister Adel Abdul-Mahdi, during a meeting with the Governor of the Central Bank of Iran, Abdul Nasser Hamti, on Wednesday that Iraq has won terrorism, "with the support of our friends" and that Iran was at the forefront. "Iraq has been able to defeat, thanks to the championships of its sons and the precious blood of the martyrs, the wounded and the martyrs, and to support our friends, especially the Islamic Republic," Abdul-Mahdi said in a statement. "The people of Iraq have suffered from the blockade and are aware of the harm done to the people by their actions. Iraq will not be part of the sanctions regime against Iran and any other people," he said. According to the statement, the Iranian official conveyed the greetings of Iranian President Hassan Rowhani and his first deputy, congratulating Abdul Mahdi on his "assumption of the presidency of the government and his efforts to achieve stability and economic prosperity." He expressed his hope for "more cooperation between the two countries, especially in the banking field." "The meeting was attended by Iranian Ambassador to Iraq Erej Masjadi and a number of bank managers in Iran. He was also attended by the Central Bank Governor, Maher Juhan, Undersecretary of the Ministry of Finance and a number of advisors. "The Iranian banks can now open assets in Iraqi banks and deal with them in the currency of the dinar and the euro," said the governor of the Central Bank of Iran, Nasser Hamati, who said that Iranian exporters can now carry out their business and conduct banking transactions through Iraqi banks. The governor of the Central Bank of Iran, "Nasser Hamati," met today, the second day of his visit to Iraq, with heads of Iraqi banks and members of chambers of commerce and a number of Iraqi economic activists. "The United States, through two stages of severe sanctions against Iran, sought to bring chaos to the Iranian street by weakening the Iranian currency, but it did not succeed, as I managed to control the currency market and reduce inflation," Hamati said. Hamati pointed to the agreements concluded between the two sides, describing banking relations as the key to the development of economic relations between the two sides. He also pointed to the determination of officials in both Iran and Iraq to expand relations at various levels between the two countries and to support Iraqi Prime Minister Adel Abdul Mahdi, Ongoing negotiations between Iran and Iraq and the agreements reached in the framework of strengthening their bilateral relations. "Based on the agreements concluded, the central bank of Iran is due to have assets in euros and dinars, where oil and gas transactions will be carried out through these funds," Hamati said. The Iranian central bank governor said that Iraq is Iran's biggest and most important partner. "According to the agreements, Iranian exporters can carry out their commercial activities through Iraqi banks, and Iranian banks can open balances in dinars in Iraqi banks. Which is shown by the Iraqi Prime Minister, is expected to become relations between the two parties stronger than before, which leads to the strengthening of trade and economic relations. " He added that Iraqi companies also can open assets in Iranian banks and conduct banking transactions in dinars. The head of Al-Rasheed Bank of Iraq suggested that a division of this bank be established in Iran, considering that this will play an important role in bilateral trade relations. The Governor of the Central Bank of Iran welcomed this proposal, describing the establishment of branches of Iraqi banks in Iran to facilitate transactions and expand agreements between The two sides. Iraqi President Barham Salih met with Governor of the Central Bank of Iran Abdul Nasser Hamati to discuss economic and financial issues and the importance of expanding trade exchange between the two countries. The President of the Republic of Iraq in a statement, on Wednesday, 'the President of the Republic, Dr Barham Saleh, received at the Palace of Peace in Baghdad, Governor of the Central Bank of the Islamic Republic of Iran Abdel Nasser Hamati and his delegation'. "During the meeting, economic and financial issues were discussed and the importance of expanding trade activities was strengthened to ensure the strengthening of financial relations, as well as to strive to support the development process and provide investment opportunities," the statement said. "During the meeting, they discussed bilateral relations and means of enhancing them in all fields, in order to achieve fruitful cooperation and partnership." 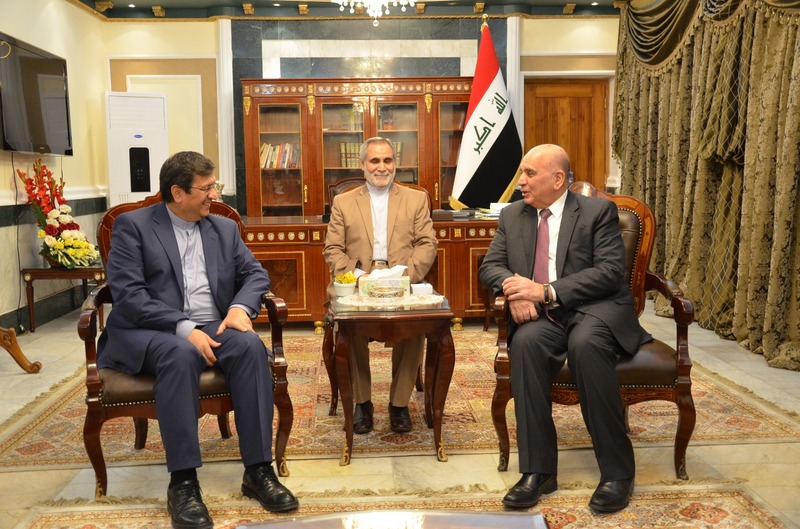 Deputy Prime Minister for Economic Affairs and Finance Minister Mr. Fouad Hussein ,received at his office in Baghdad on Wednesday 6 -2-2019 central bank governor in theIslamic Republic of Iran Abdel Nasser Hemmati and his accompanying delegation. During the meeting, they discussed the bilateral relations between Iraq and Iran and ways to strengthen them and develop them, especially in the financial and banking fields for the benefit of the two neighboring peoples. The two sides also discussed in the presence of representatives of the Iraqi Ministry of Finance, the Central Bank, the Iraqi Commercial Bank, the Ministry of Electricity and the Ambassador of the Islamic Republic in Baghdad the best ways and solutions to pay the Iranian dues to Iraq through the purchase of electricity and gas and the continued work of the joint technical team. A source familiar with Iraq's refusal to pay debts owed to Iran. The newspaper quoted the Middle East Saudi Arabia, a source - said he was familiar with the scenes of the meeting between the governor of the Central Bank of Iraq Ali Alalak and his Iranian counterpart Abdul Nasser Hamati - yesterday said that the relationship "rejected the Iranian demand to pay Iraq owed by the debt of Iran in the dollar; American sanctions against Iran. " The source added that "the Iranian delegation came to an agreement to fulfill the debt owed by Iraq more than one billion dollars to the Iranian side." The governor of the Central Bank of Iran Abdul Nasser Hamati had visited Iraq on Tuesday and announced that he signed with his Iraqi counterpart Ali al-Alaq after 4 hours of talks an important agreement with the Central Bank of Iraq to address the obstacles of transferring money and pay Iraq's debts to Iran's gas and electricity exports to it. He pointed out that "there is a serious will of the Iraqi side to address the problems," noting that "Based on the consensus, the monetary and banking relations between us and Iraq will be within the framework of the euro and the dinar, where the Central Bank of Iran account in Iraq on the basis of the dinar and euro will be completed banking transactions through banks Iraq ". He added that "during this visit, as well as the identification of a mechanism for financial payment between the two countries, the agreement to remove the problems related to the transfer and return of returns of Iranian exporters to Iraq from hard currency." The governor of the Central Bank of Iran, Abdul Nasser Hamati, said that the obstacles will be removed from the way to pay Iraq's debts to Iran related to gas and electricity exports, according to the agreement signed between the two countries recently. Hamati said in a press statement on Wednesday on the latest conditions of cooperation between the two countries under the US embargo and the issue of Iraq's debt to Iran, Hamati said that during this visit, as well as a mechanism for financial payment between the two countries, the agreement to remove the problems related to the transfer and return of returns Iranian exporters to Iraq Of hard currency. " Referring to the US embargo, he said, "We understand the problems and conditions of the Iraqi banks and the banks of other countries in the world, and we are doing our best to continue our economic and banking activities without harming the other side." "Accordingly, we have signed agreements and we are confident that these mechanisms will become more gradual and overcome the problems," he said. "With regard to Iraq's debts to Iran's gas and electricity exports to Iran, we have signed an important agreement with the Central Bank of Iraq (CBK) after 4 hours of talks to deal with the obstacles of money transfer and debt repayment," Hamati said. "There is a serious will on the part of the Iraqi side to deal with the problems," he said. "Based on the consensus, the monetary and banking relations between us and Iraq will be within the framework of the euro and the dinar. The Central Bank of Iran will have an account in Iraq on the basis of the dinar and the euro. Iraq ". Iran's oil minister, Bijan Zangana, attacked the Iraqi government on Thursday, saying that Iraq did not want to pay two billion dollars to Iran for the price of imported gas, in compliance with US sanctions on Tehran. "We refuse to cooperate to invest small oilfields in the border city of Muhammarah, while they demand joint action in the big fields exclusively, which is opposed," Zangana told a news conference. Our interests ". The Iranian minister said that 'the issuance of US sanctions made Baghdad strongly committed to the extent of the cancellation of small agreements, such as the Kirkuk deal, which we exchange 11 thousand barrels of oil per day', adding that 'for years we were exporting Iranian gas to Iraq worth 200 million dollars a month, But the Iraqis are not paying the price since the issuance of Washington sanctions on us, and the amount accumulated today and reached two billion dollars, which Baghdad refuses to pay in accordance with US sanctions. "The Iraqis have their own perception of interests like any other, and no country is ready to sacrifice for Iran today, including Iraq," Zangana said. Iraq, New Iranian Central Bank / New currency map is on its way? The possibility of opening a dinar account of Iranian banks in Iraq and opening branches of one of the largest Iraqi banks in Iran will mark a new chapter in the interactions between the two countries. In the past days, Abdel Nasser Hemmati completed one of his most important business trips during the Central Bank's time, according to the Mehr News Agency. A journey where important meetings at this historic point of the Iranian economy took place, and of course, the agreements that took place on the fringe, may have provided one of the most unique opportunities to the Iranian banking system, which, if properly implemented and timely implemented, It can be an important and effective step in the field of the Iranian foreign exchange system . Accelerating the Iraqi debt repayment system to Iran, the activity of Iranian exporters through Iraqi banks, and the possibility of opening an Iranian bank account with the dinar and the euro, including agreements made with the Iraqi authorities at separate meetings of the head of the Central Bank of the Islamic Republic of Iran. Many banking experts say the deal, along with the importance of time for Iran, will be positive in terms of currency remittances . Of course, the success of the implementation of these agreements necessarily involves the political will of the two sides to timely and in accordance with the agreements reached, in particular, that Iraq has for months been the first Iranian trading partner and has the largest exports Non-oil Iran. In addition, at least in the last few months, Iraq has been able to influence the foreign exchange market with its foreign exchange markets Herat and Sulaimaniyah. Majid Shakeri, an economic analyst in an interview with Mehr News Agency , referring to the visit of Iraqi Central Bank Director Abdul Nasser Hemmati to Iraq, said that the trip was both the most important and positive in terms of the content of the Hawala Of foreign currencies this year. In addition, Iraq is a very important country in Iran's foreign exchange map and is considered to be the most important export destination of Iran in recent months. He added that the Sulaimaniyah market is a bazaar related to Istanbul, Herat and Dubai, and thus has a serious impact on the cash market of Tehran, while considering the demographic situation in Iraq, the access of currency to the Central European and South American countries It is found in this country . Shakeri believes that among the countries that have successfully succeeded in converting their currency into dollars, Iraq has the best conditions for security cooperation with Iran and has the most consistent security interests with Iran, which is why Iraq has a very important point for Iran. Including the results of the visit of the Chief of the Central Bank to Iraq, subject to the implementation of the agreement, is an appropriate access to the facilities; in addition to all the cases, such as opening an account of Iraqi companies in Iran, opening an account for Iranian banks in this country. And the opening of dinar accounts is also very important . Shakeri said that if the dinar was a currency such as the Indian Rupee and the Russian ruble, this trip could not be very effective, but the dinar is very strong due to Iraqi foreign exchange earnings, and because of the interplay between these incomes and the interests of American companies, in the long run, the problem No special occasions . Why is foreign exchange agreements important with Iraq? He stated that the status of Iraq is very important, saying that the news out of the agreements shows that all actions have been in line with the purpose and the real work; the time of the agreement is also important, because in the second half of the avalanche and March because the market is more or less dormant, it is a good condition for implementation of these policies. Moreover, if these agreements are well implemented, it will be possible before the next year's payment system will be deployed in May. , Use this system appropriately. Shakeri said that Iraq has other positive points for us, and that those populations in the south and north of the country, said that their respective textures are on the Iranian border, allowing the offices to be completely disconnected, similar to those between Tehran And Dubai exists for the Iranian and Iraqi side; while the border between Iran and Iraq is in a way that corresponds to the availability of money transfer with banknote access and reduces the sanction of the settlement unit . The expert in economic affairs, arguing that the gender segregation of US interests with a part of Iraqi society is such that Americans can not isolate a bank in Iraq for cooperation with Iran, stated: "It seems that the head of the central bank and The country's foreign currency team has been pre-contemplated in terms of prioritization of the previous program, but along with all of these, what makes the security attachment necessary to get a good financial result in order to make Iran a good financial result, Iran's security implications West Asia and helping Iraq during ISIL's invasion . He stated: "The sum of these conditions says that, in contrast to the concept that the Europeans put forward, and in line with that, Iran must deal with the security gains in West Asia and receive direct access to the euro against it, a new concept can be born." Which lies on the resistance axis, which has had security and military layers to this day . Shakeri said that this concept is technically more powerful, more credible, and more in line with Iran's security conditions, so that the access that Iraq opens to us does not solve all the problems, but it does not solve a significant part of the problems with approximation. Well, it can be solved on condition that it is executed . How effective is Iran-Iraq exchange agreement? Sayed Kumal Seyyed Ali, a former deputy foreign currency deputy of the Central Bank, said in a conversation with Mehr correspondent about the change in Iran's foreign exchange map and recent agreements with Iraq, saying: "Certainly, because these agreements have been signed by the head of the Central Bank, the current situation The country's currency is included in terms of sanctions. Accordingly, what is happening is that when the two sides work with local money, they set off their sanctions, but they must also consider the dinar's use of the country; in other words, if a Iraqi exports goods to Iran, and we want to give it the money from the purchase of goods, we can pay the dinar at the disposal of the receivables, or if we export and they want local currency to us Give it, it's possible. Seyed Ali said that Iraqi exports to Iran and Iran should be compared to Iraq so that the two sides can settle this money, but the important thing in these agreements is that if the dinar we obtain at the right rate becomes International currencies will be of benefit to bothers and can be important for exporters because they reduce costs. He said: if Iranian banks and individuals have a euro account in order to receive the dinars they receive for selling their goods, they will be able to convert to the bank, which they account for, into dollars, dollars and euros, the benefits will be much higher; The agreement concluded by the head of the central bank also states that Iranian exporters can use this mechanism. Seyed Ali noted that the actions taken by the Central Bank in Iraq, if executed and the possibility of converting the dinar into global currencies, is a good and big job and should provide a land that would convert the dinars resulting from exports to the country. Other currencies and, through that, provided part of the country's currency needs. He said: "Monetary treaties will be activated when both parties can use common currencies to maximize their profits. Iran's state-run Tavaner Electric Co. signed an agreement Friday to extend 1,200 megawatts of electricity to neighboring Iraq, the state-run news agency IRNA reported. The two countries also signed agreements in Tehran on the production and export of electricity and the transfer of technology. "The debt has been settled and the repayment has started," IRNA quoted Iranian Electricity Minister Reza Ardkanian as saying at the signing ceremony, without disclosing the value of Iraq's debt to Iran in exchange for electricity exports.